An Ellington homeowner said concrete poured for her four years ago is already deteriorating, according to testing. The case is so recent it could become one of the first where the concrete manufacturer at the center of the crumbling foundations' situation, or its insurer, could be on the hook. Not only did cracked basement walls of Marya Mahoney’s 1998 home test positive for the naturally occurring mineral pyrrhotite, which some experts believe is the cause of crumbling concrete, so did the core sample from the concrete frost wall, poured along with a slab for Mahoney’s detached garage in 2013. Most concrete does not show outward signs of cracking from pyrrhotite for well over a decade. Core samples can detect it earlier. The one from Mahoney’s garage was taken from a spot where small cracks had appeared, analyzed by TEC Services of Lawrenceville, Georgia. "They characterized the deterioration as strong to very strong, which is the same language they used to characterize the level of degradation in the main foundation," Mahoney said. Mahoney said concrete from her basement and garage came from J.J. Mottes, the company at the center of the state's investigation into crumbling foundations. J.J. Mottes said it has been out of the concrete business since the end of 2015. Mahoney said her homeowners’ insurance policy does not include replacing her basement, but the company was willing to negotiate a settlement to cover a portion of it. The repair can cost upwards of $200,000. Mahoney adds her insurer will not pay to replace her garage since the concrete was poured in 2013. State law allows people to make a defective product claim within ten years of purchasing a product and three years after noticing a problem. Mahoney first just asked the company to make the repairs. It refused, so now she will sue the company, the concrete installer and concrete supplier. Since concrete for Mahoney's garage was poured four years ago, whoever insured J.J. Mottes could be on the hook, according to Mahoney's attorney, Brenda Draghi. A Mottes spokesperson said the company is not commenting since it is out of business. 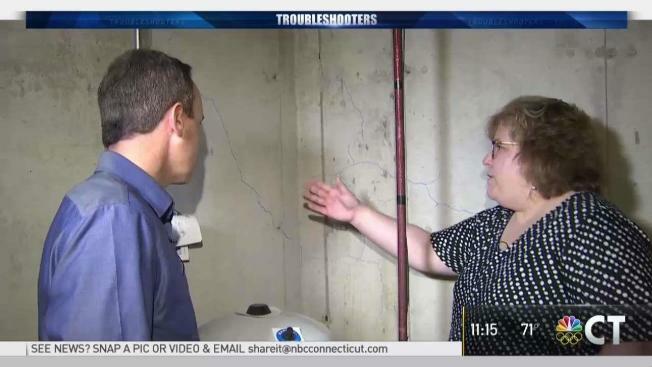 A representative previously told the NBC Connecticut Troubleshooters it believed the problem was caused by installers, not its product. Draghi said it’s a tough realization for people to realize they can’t go after J.J. Mottes, "but the difference now is, that people that have a product that was made within the last 10 years, can." Lyle Wray with the Capitol Region Council of Governments has been assisting more than 30 Connecticut towns with crumbling concrete. Wray believes proof concrete poured in 2013 had pyrrhotite is significant. It could greatly increase the group's estimate of well over 4000 homes with crumbling concrete. "The issue in terms of this latest aspect is troubling for a couple reasons. I mean one is that (it is) way after the time frame we had originally thought and that concrete was still being poured," Wray said. Wray adds newer homes with pyrrhotite may have less chance of cracking. The mineral creates cracks when exposed to oxygen and water. Many newer basements have to waterproof which is required by state code. It is not mandatory for an above ground garage like Mahoney’s. The Department of Consumer Protection said it has a small number of reports regarding foundations poured after 2000 and it hopes more affected homeowners file complaints so the state can better understand the scope of the problem. Our attorney general and Department of Insurance both declined to comment.